So I have finally done it! It has taken me a year to get around to it but I have knitted Slide using Rowan Tumble in the colour marshmallow. Here I am below wearing it! 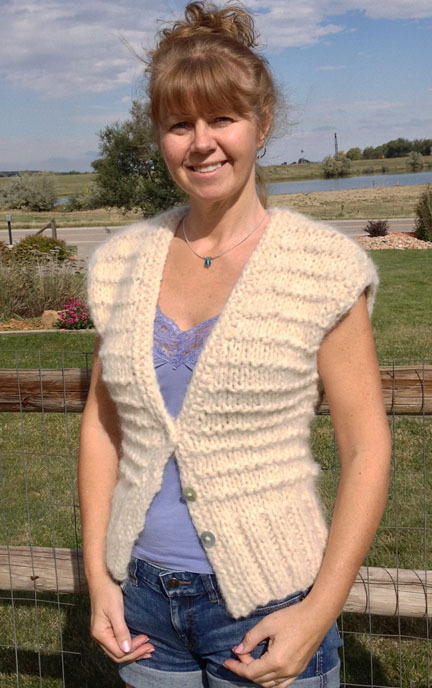 I saw this pattern when the yarn Tumble first came out about a year ago and I thought I would love to knit it. I completely forgot about it until Rowan sent me a ball of Tumble in Amethyst, a lovely deep purple colour. I didn’t have the pattern for Slide so I bought the pattern book, also called Tumble, bought my yarn and cast on. You may notice that I made it a little longer than the actual pattern design……I have a really long back! 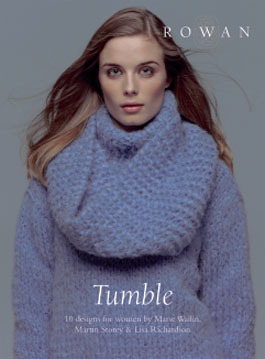 What’s great about Tumble is that it knits up really quickly as it is a chunky yarn using 12mm (US) 17 needles. Rowan describe this yarn as “a glorious lightweight, soft and lofty yarn“ and they are so right; it is so soft and cuddly with hardly any weight. 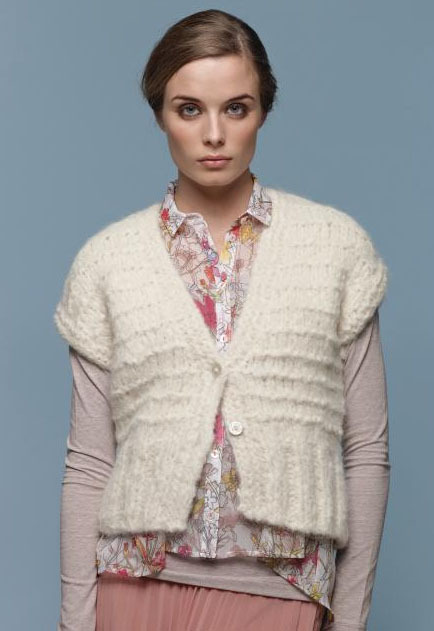 This is because it is made from 90% Alpaca and 10% Cotton. I am a huge fan of alpaca yarn because it feels so soft against the skin and is very spongy…….in the nicest possible way! The pattern book ‘Tumble’ is a collection of 10 easy to knit, easy to wear winter garments and accessories designed by Marie Wallin, Martin Storey and Lisa Richardson all knitted using the soft and cosy Tumble yarn……..perfect for cuddly winter knits! I would also like to knit these cable wrist warmers called Topple shown in the photo below. Unfortunately, the pink colour Bon Bon has been discountinued so if you like it you may want to buy it asap if you find it for sale anywhere……I wish I had done so. These are the current available colours. 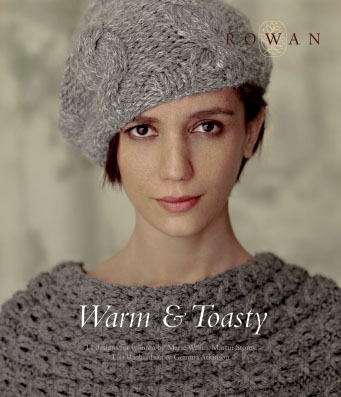 You may also be interested in one of Rowan’s more recent winter collection pattern books called ‘Warm and Toasty‘, featuring designs using Tumble and Alpaca Chunky. ‘Warm and Toasty’ is a “beautiful collection of women’s accessory designs from simple shrugs and capelets to snoods and hats. Using the stunning yarns, Alpaca Chunky and Tumble, the collection offers small projects to keep you ‘warm and toasty’ throughout the winter months”. 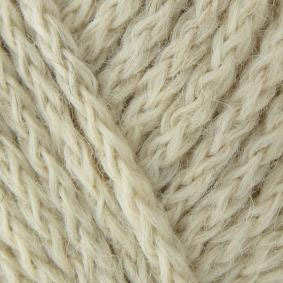 Alpaca Chunky is a beautiful alpaca yarn which is incredibly soft, just like all alpaca yarns. It consists of 98% alpaca and 2% polyamide. In the picture below you can see that it has a rounded chain construction; this creates a yarn which is light in weight yet warm and comforting to wear. As it is a chunky yarn it knits up quickly just like Tumble with a recommended knitting needle size of 10 mm (US 15). The shades available are more subdued than Tumble; they are very much neutral hues. I would love to make this rib and bobble detail snood (below) called ‘Jester’ from ‘Warm & Toasty’, a design by Lisa Richardson using Alpaca Chunky. For many of these patterns you only need a few balls of yarn to complete a whole project and they are suitable for the average knitter. I have 3 balls of Tumble in Amethyst and I am going to knit Katy, in the photo below, from ‘Warm and Toasty’ soon…….I promise myself!